Robot Master one is a game where it is going to be necessary to constitute a table of 25 cards, that is to say a square of 5x5 cards. 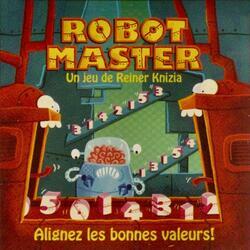 the game is made up of 36 cards, six families of six robots having a value between 0 and 5. one of the players will play with the lines and the other with the columns. Each player receives twelve cards, and one of the remaining cards is turned over, which will constitute the center of the board. In turn, each player will place a card that must necessarily touch another card from one side. And that's all. The value of each row and column is calculated by adding the value of the robots that make it up. Except that if a player lines up two robots of the same value, their sum is equal to their x10 value. Obviously, two Robots of value "0" are always 0 (0x0=0 or Toto's head, it is well known). If a player can line up three robots, their total value is always 100 ("0" included). Aligning four "1" has a value of 101 (100+1). At the end of the game, the objective is to achieve the lowest score. That is to say, we compare the two worst rows and columns of the two players. The game will therefore consist in rotting as much as possible one of the opponent's lines and not in achieving the best possible score. We will therefore have to be present on all fronts at the risk of seeing the victory win all at once.